The Cover Contessa: 2500 Twitter Followers Giveaway! The Cover Contessa (@covercontessa) has reached 2500 Twitter Followers! In honor of this milestone (and my birthday today!) 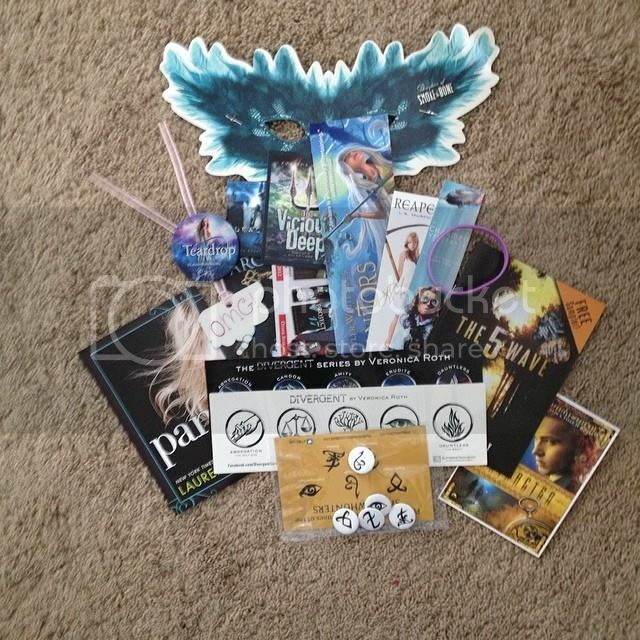 I'm giving away the following swag package! Want to win? Just enter the Rafflecopter below. All entries will be verified, terms of service apply! An it's International! Best book(s) of 2014 for me till now would be Sophie Jordan's UNINVITED and Rosamund Hodge's CRUEL BEAUTY. Thanx for the giveaway and happy birthday! Oh I LOVED those two! Aparajita you and I have very similar taste! Thanks! Happy Birthday and Congrats on the followers! I loved White Hot Kiss. Alienated was cute, but I felt like it was missing something! Thanks for stopping by! I loved "Tangled" by Emma Chase. I haven't heard of that one, will have to look it up! Thanks for stopping by and good luck! I've heard great things and plan to read it. Thanks for stopping by! I'm reading Pivot Point right now and I really like West's writing! Looking forward to reading this one! I haven't started that series yet, but have heard great things. I loved Split Second by Kasie West and Ignite Me by Tahereh Mafi, but yet so much books to read! I'm reading Pivot Point now. Really liking it. Loved Ignite Me! Thanks! I'd have to say And We Stay by Jenny Hubbard. Congrats! Never heard of this one. Thanks! Still BURN OUT, and I read that last year. LOL. Can't wait for the release! I really enjoyed Be With Me. But I liked White Hot Kiss even more! Unhinged was great! I have a copy of The Tyrant's Daughter. I'll have to get on it! I can't choose just one... This year I love the Vanir Series by Lena Valenti an spanish author! Her books are amazing!!! I love her books! but I don't know if exist an english edition ;( Happy B-Day btw!! I really want to read that! Ignite Me by Tahereh Mafi! Although, I didn't get the ending that I wanted, it was still an enjoyable read. Ignite Me seems to be the popular one here! I loved it! I just finished Finding Esta by Shah Wharton and I love, love, loved it!!!! I did like this. But I liked Trust in Me more, probably b/c I lust over Cam! LOL! Wait until you read White Hot Kiss! I haven't read any I loved. :( The books I've read have all been just okay or terrible. I hope you find something soon! I need to start this series! I have heard great things! I am reading Pivot Point now. I like West's writing. I want to read The Distance Between Us, then I have an ARC of the next one. Be With Me was good, but I preferred Cam and Avery. Up From the Grave by Jeaniene Frost. I read this, but not the other two. Enjoy! I haven't read any books that have been released in 2014 yet-I'm still working my way through last year's TBR pile! But I am looking forward to Dreams of Gods and Monsters by Laini Taylor and Panic by Lauren Oliver. What book have you read so far in 2014 that you love? I got to read Panic and, while I'm a huge Oliver fan, I was not impressed. Hope you enjoy it more than I did! Loved Ignite Me. Haven't read the other one yet!